After a good amount of time spent with this game all I can say is that I wish it lasted a little longer. It only packs 8 courses (and some say, a secret bonus track but I wasn't lucky enough to have unlocked it) and it is generally pretty brief, in other aspects as well. 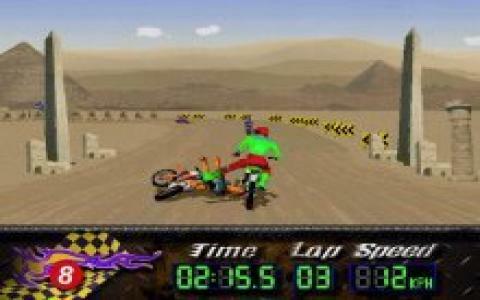 For instance, it also packs a short supply of bikes, but then again, all you need to finish the tracks is one single bike, which you should choose depending on your particular style of play. Either way, don't sweat too much over this choice, truth is most of the bikes behave similarly with only flavor like differences. Now that I think about it, it might be that its briefness comes as an advantage to the game, because the graphics can get a bit on your nerves. I don't know why the game looks like it was made in the early 90s, maybe because it was a game developed to go straight into the bargain bin, or for some love of the past, but at any rate, the still sprite based graphics sure are past their due in 97. Well, at any rate, if you don't mind that graphical style, the modern interfacing with the game will probably make up for the lesser graphical quality, but do keep Moto Racer around as well, a much more graphically endowed dirt racer. 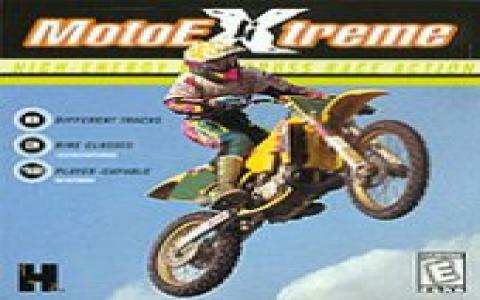 Not that Moto Extreme will disappoint, cause it won't, but just to have your options open.